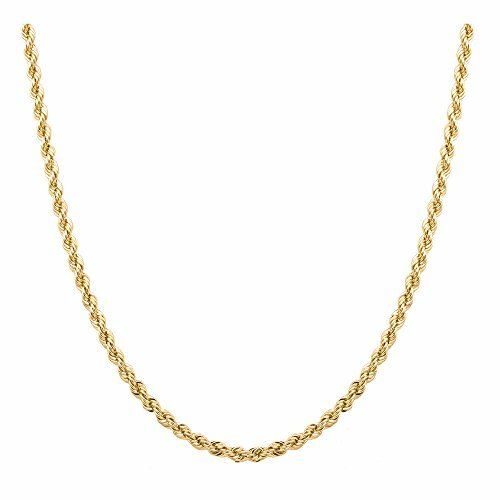 This Italian sterling silver rope chain in yellow gold plating is a beautiful simple elegant piece for everyday wear. Can be worn alone or paired with a pendant. Makes your everyday look even better can be worn with most outfits. QUALITY: Guaranteed .925 Sterling Silver. This is not the fake stuff that will irritate your skin or turn colors after a few weeks of wear! FINISH: Gold Flashed, high polish finish. Stamped with .925 to ensure Sterling Silver base. PACKAGING: Comes packaged in a branded Pori Jewelry Gift pouch, ready for gifting. Perfect gift for birthday, Christmas, stocking stuffers, graduation, Valentine's Day, Easter, Mother's Day and any other holiday or celebration.